FOR US, TRAVEL WRITING is about spreading the news of pleasures to savour; finding something a little different, possibly with a dash of adventure to sharpen your wits. a blaze of publicity. What about the war? you may ask. Apart from stemming the flood of money sent to Serbia's Belgrade not a lot has happened, other than restoring a pleasant way of life. In time terms; about ten days, the damage was limited to dest-roying one tank and now some-one has added that a bridge was blown up. There was also a great influx of journalists trying to find something to cover  one TV crew memorably and, much to our amusement, showed the museum piece of an old aeroplane displayed outside the main airport as a part of Slovenia's current air force. Slovenia, often confused with Slovakia and Slavonia, is about half the size of the Netherlands. It must be the least known country on the north shores of the Mediterranean and, within an hour or so driving, has the least known Alps. Whilst on unknowns, as my mother used to say: "If you do not have something good to say, don't say anything". Therefore our hire car shall remain anonymous and as you would certainly never choose it, let alone buy it, we will leave it out. That said, the roads in Slovenia are relatively uncrowded and pass through some stunning scenery. Shame about the car as there are driving pleasures still to be enjoyed. The few motorways are inexpen-sive and provide the quick links from the coast to the mountains; the secondary roads are rewarding, often with fast sweeping bends, but beware of local life as the roads pass through tightly-knit villages with tractors going about their unhurried business. The mountain roads often feature tight hairpins, narrow widths, un-spoilt long vistas and some great dives and drives  the Loibl Pass road, which is somehow stitched onto to the steep mountainside for the run down into Austria, will get the adrenaline running. or as few activities as you wish. The best clue as to its location is by looking at the flight options: Ryanair into Italy's Trieste just to the south west and, just over Austria's southern border to Klagenfurt and the newly added route to Maribor, Slovenia's second city. EasyJet and the national airline Adria fly into the capital of Ljubljana  the latter is run largely along the model of the low cost airlines but, like much of Slovenia, Adria Airways is a little bit more civilised than the others. few people  certainly from the UK  have discovered its pleasures. Ljubljana goes its own way and tourists fit into its way of life, the atmosphere is friendly and the centre is intimate and normally relaxed  until you try for the umpteenth time to find the road up to the castle which overlooks the city. In preserving the castle they have taken the bold step of restoration, putting in some modern architecture. It works, as the dreaded Disney effect is avoided. Nowhere gets further away from Disney than the Baroque library next to the cathedral. Even if you normally have no interest in 'culture' this is a must-see for everyone. The library is open to the public, but you should call for an appointment as the ancient but charming professor oversees the visits. been installed. Fully justified, as the library's loss through fire is a risk that is not worth thinking about. Europe seems to be adopting standard prices throughout, particularly where the low cost airlines serve: cheap flight  increasingly expen-sive hotels and meals. This may well apply to Slovenia in the future, especially as they have just put their head in the Euro noose. The knot is tightening as they have just experienced the usual inflation leap. However, the costs of living throughout are still low, even in Ljubljana and the entry to the library is free. Where else would that apply? of Ljubljana. It sounds a large place when described thus, but we are generally looking at two-hour journeys to get anywhere. Not dismissing the eastern part of the country as Maribor, whilst it is regarded as rather industrial/commercial, has a city centre that is old and attractive. People who want spa holidays will also travel east. However, most larger hotels everywhere now offer the facilities of spas and gyms. The price of a massage is around £20 for up to an hour of pleasure  or torture! Some say they are not to be missed. 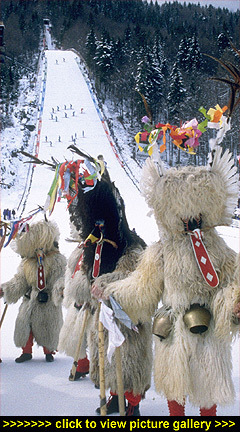 The focus of skiing is Kranska Gora, where world cup races are held. But the scope for a week there is relatively limited compared to the major European destinations. Keen skiers will want to visit a number of resorts during a week's holiday; which is rewarding as the variety is wide from Bovec, which somehow was grafted onto the mountain top without falling off and which is reached by a 40-minute ride in a small 'tele-cabin' lift, to Bohinj  high above the eponymous lake, where there is a more intimate atmosphere. You have the choice of mountain-top ski-ing or gliding through glades of trees, plus there are some good atmos-pheric hostelries en route. Summer holidays are not so easy to summarise as short articles pre-clude giving the full range of activities and lazing options. Take your pick of horse riding, paragliding, canoeing, fishing, swimming, cycling and, of course, the walks are magnificent. A mention of the Soca Valley in the national park has to be made in that context. A great trip is to take the steam train between the lakes of Bled and Bohinj, as this is a great treat for all ages as the line meanders through the valleys. This race around the countryside in words will give you a flavour, but part of the fun is finding the hidden treasures on your own. Before setting out, a great base for touring is the small lakeside town of Bled. It ticks all the boxes; beautiful lake with an islet on which there is a church and towering over the lake is a sheer rock face on top of which is an enchanting castle. Out of a few very good restaurants and a few good places to stay, we would pick out a small, traditionally-styled hotel called Pension Mayer. and tunnels and even a small railway. Nearby is the stud farm for the Lipizzaner white horses so famously used at the Vienna Spanish Riding School. Driving on, you will soon reach the short Slovene coast which has two main tourist destinations. is a great put-off, whilst the food at Piran's unpretentious and inexpen-sive Primare restaurant can challenge Portofino's best. Portoroz, the next resort, is the 'Riviera' with a palm-lined quay, prom-enading and grander hotels. Its more cosmopolitan approach is not the general image of Slovenia. If you like the south of France you will find much the same here, but it is so much better value for money and is less worried about status. For us, it is the less organised and off-the-beaten-track places that are so worthwhile  the quiet charm, despite two pages in the guide book, of the old town square in Radovljica. Here you will find spec-tacular gothic, renaissance and vernacular architecture, all standing high above the Sava river which later becomes the Danube. Skofja Loka is another gem for history, culture and architecture. Just listing these delightful places cannot do justice to the quiet but dramatic beauty of the country. In spring, there is a quilt of fresh growth with soft mauves which are the swathes of wild crocuses. Eating and drinking is a pleasure here too, but the quantities served can be daunting. Not only is the restaurant food excellent, it is again very good value for money. You will find the usual fayre but look out for some of the most tender venison, wild boar dishes and obviously very fresh local vegetables. On the drinks front, not everything is likeable at the first or even the tenth try. The wines are good and it seems their favourite red wines are usually a mix of the merlot and cabernet grapes whilst their white wines are the local version of pinot grigio, grown and produced just across the border in Italy. The challenges come with the grappas. When young and colourless they test the taste buds, but when they are aged, the colour is a mellow light brown and that is worth the ten or twenty years' wait.